The Perfect Patchwork Gift To Give. Being busy working on the quilting on my quilt, I didn’t realize a good friends birthday in just in two more days. This is why being a quilter, you can come up always with a good idea to make for a gift to give to a friend. Easy to make, cute and useful. While I was thinking on what to make for her, I got to think once more, some times people use to think Quilts and Patchwork is only to make big quilts or pillows. Patchwork can be as versatile as you want to. That’s it, patchwork is so versatile that you can make many things with it, big size, medium or small, so complicate to make or really easy to make. This time, I decide to take one of the patterns I’m working on for my quilt, and make something with it, this way I can also share with you the idea to use each one of this pattern on something else, this quilt will be great, once you get a pattern, you can also make something different. It took me just one hour to start from starch to finish this hand towel, I must say, the towel is not a fancy one, I got it from the dollar store, with the idea to make something with it. 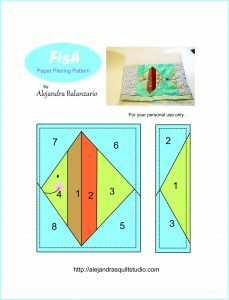 I made the fish first, thinking on my friend, and I know her favorite color is green, so I picked some green fabric for the fish and of course, some blue fabric for the water, the two stripes in the fish, I picked two fabrics, one in orange and one in brown. To make the fish took me about 15 minutes, I iron it, and trim it to 5 x 5 inches, I wanted to see how this size of pattern looks like on something different than a quilt. I added one strip of another fabric, this time I picked one in white with blue, so the fish looked like framed, I sewn it to the towel, and I added a strip of green fabric on the bottom. I made some embroidery with black thread for the eyes, mouth and a few details on the fish body and tail. With pink thread and satin stitch I did the cheek. 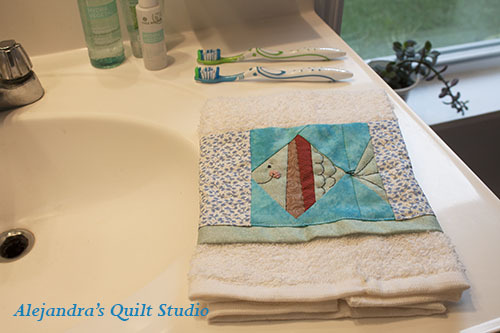 On the two pieces of fabric on both sides of the fish block, I did some quilting free hand on the sewing machine. I just folded as towel should be folded to look nice, and voila! I really like how it looks! Isn’t nice how a small paper piece pattern can make a simple white towel look cute! I’m happy to share with you this idea, let me know what you think of it, you always can leave a comment. If you find this idea cute to make, you can pin it so you can find it later, I thank you for any share on Social Media or on your blog. I would love to know you made this towel, and if you blog about it, let me know I will pay you back a visit. I thank you for keeping this Free Paper Piecing Pattern for your personal use only. 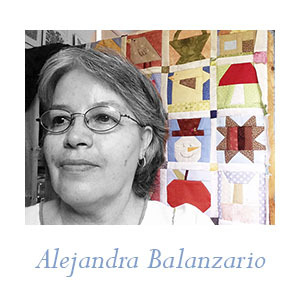 Hola Angie, bienvenida a Alejandra’s Quilt Studio, encantada de compartir el Patchwork contigo, no tengo videos por el momento, pero podemos idear la forma en que puedas iniciar alguna labor sencilla de Patchwork, te parece bien?